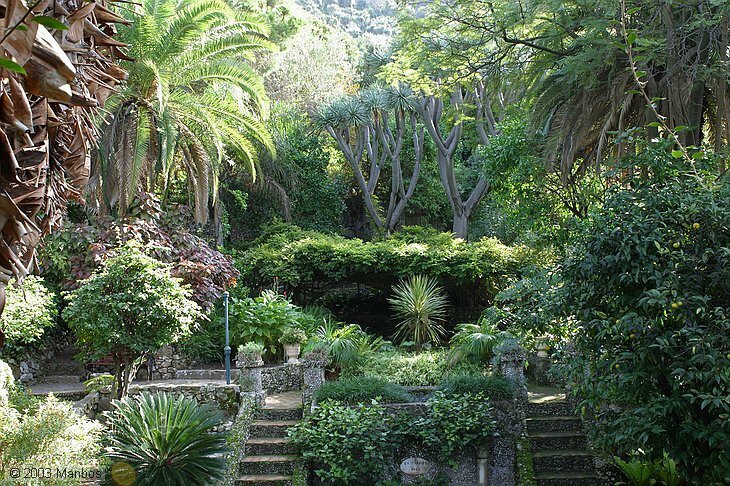 1816/19 The following year the Alameda Gardens were opened. The funds needed were raised by lottery and there was an influx of Genoese 'gardeners'. 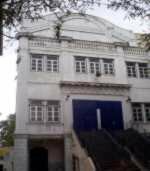 The much needed Civil Hospital also opened its doors to the public for the first time. The Civil Hospital in the early 20th century. One year later my great, great grandparents, Giovanni Batista Sacarello (4.5) and Maria Dominica Bignone (4.6) got married in Gibraltar. He was twenty-seven years old, and Dominica (4.6) was twenty. The name Sacarello does not appear on the 1814 census or in fact on any previous one. Nevertheless there is concrete evidence that the marriage took place as it was registered in 1817 in Book 6 of marriages in the archives of the Church of Santa Maria la Coronada. Giovanni (4.5) was the captain of a ship trading from Livorno. 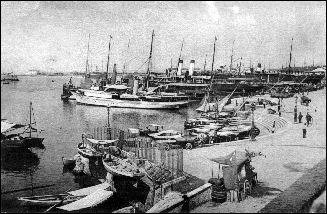 Scenes from Livorno harbour in the early 20th century. It can hardly have been all that changed from the days in which Giovani Sacarello (4.5) traded from there as a sea captain. Giovani (4.5) was a frequent visitor to Gibraltar, where he met and wooed Maria (4.6). Whether for her family's sake, economic reasons, or simply because Maria's father insisted that he who pays the piper calls the tune, he married her in her own home town. Another of my great, great, grandparents, Joseph Chipolina 'El Cartero' (3.1) was born in Gibraltar perhaps in one of the houses in the patio 'El Nazo' which bore his father's nick-name. 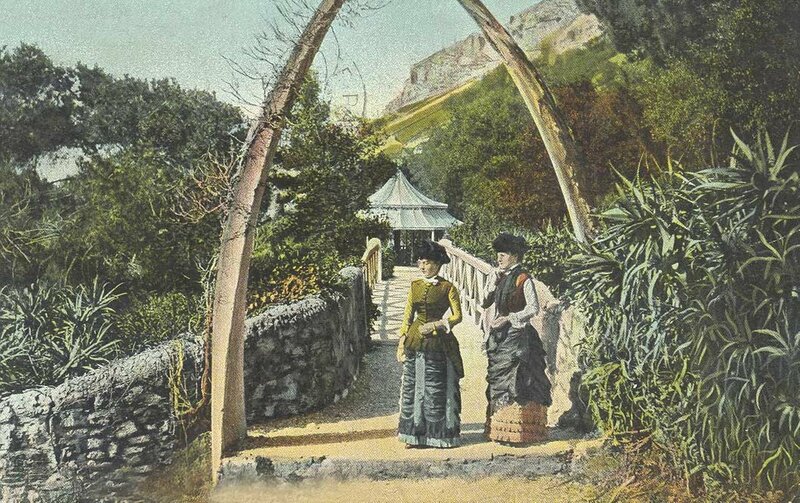 Gibraltar, however, continued to revel in its Britishness and a bust to Wellington was unveiled. 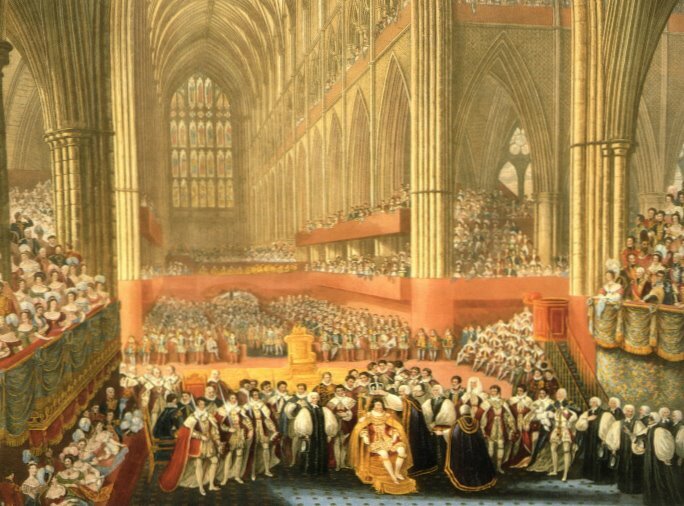 1820 The following year George III died and George IV was crowned king. There was also change at the top in Gibraltar as the Earl of Chatham took over as Governor. 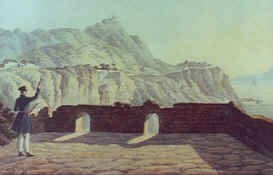 Most of the time, however, the fortress was run by his deputy, Sir George Don. 1821/23 Two years later the first steam vessel reached Gibraltar and was greeted here as elsewhere with much amusement. 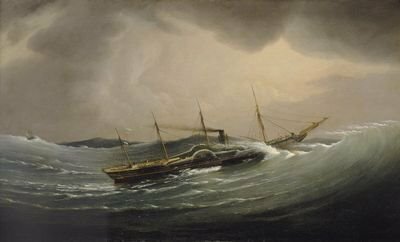 But the jokes soon palled when it was realised that steam was here to stay and that Gibraltar was to lose many of her callers as the steamers could pass through the Straits without stopping. Two early 19th century steamships of the type that caused such hilarity in Gibraltar. Both were built by Isambard Brunel. The one on the top is the Great Western and the one at the bottom Great Eastern. The masts of the latter were called by the days of the week, Mondays to Saturday. When asked why there was no Sunday, the sailors replied that it was because there were no Sundays on the Great Eastern while at sea. Greeted with far less amusement was a daily poll-tax levied on strangers. As with many other attempts elsewhere the tax proved impossible to collect and was soon abolished. It was also the year in which President James Monroe of the U.S.A. proclaimed his 'Monroe Doctrine'. 1824/28 The civilian population of the Rock was estimated to be 15 480. People were still emigrating to the Rock. By implication Gibraltar ceased to be a Free Port when an Order in Council put charges on hulks and pontoons in the Bay. These were to all intents and purposes smuggling depots. In September yet another yellow fever epidemic had begun. As a precaution, a number of aliens were asked to leave. They promptly took up residence in the newly taxed hulks and lighters in the bay. Generally, the situation had become so desperate for the poorer sections of the community that the Ladies Needlework Guild, under the auspices of the Governor's wife, decided to lend a hand. They raised 27 000 Spanish dollars, 'for the relief of the poor encamped on the Neutral Ground.' By December the epidemic had exhausted itself. 1 667 inhabitants died. The population, however, continued to rise and now stood at 17 024. In an attempt to stop a recurrence of the epidemic, General Don prohibited any assistance to ships involved in the Slave Trade. Some time later the pirate slave trader, Benito de Soto was captured and hanged. 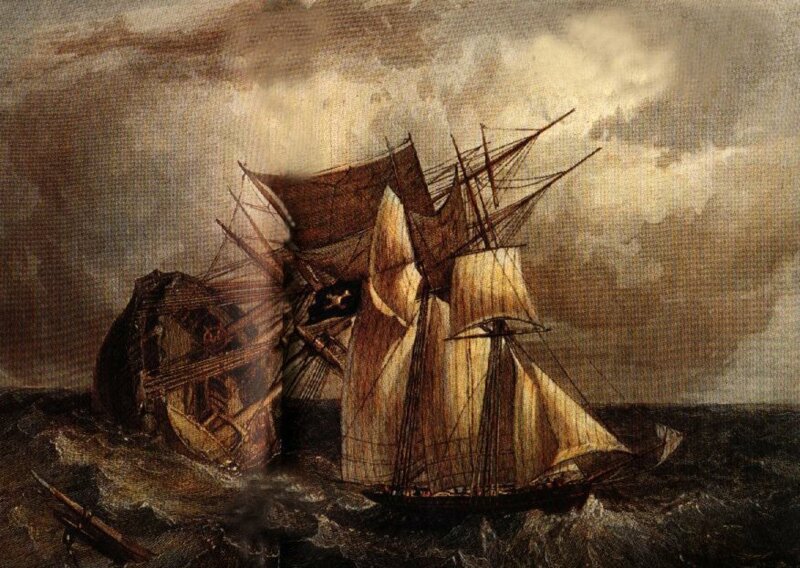 Benito de Soto’s Burla Negra plundering the Morning Star an East India trader. De Soto escaped to Gibraltar after his crew abandoned ship in foul weather off the Spanish coast. Unfortunately for him the Morning Star eventually also made it to Gibraltar and some of the passengers recognised him. Meanwhile my other great, great grandparents, José Mancilla (4.15) and Magdalena Porras (4.16), now in their twenties, had met, courted each other and married. On the 13th of March 1828, their daughter, Magdalena Mancilla (3.8) was born and baptised in Coin. She was lucky it was in Coin as it was not the best of times to be born in Gibraltar. 'El Nazo’s’ (5.1) last legitimate child was also born around this period. He was called Andres. Although 'El Nazo'(5.1) had six officially registered offspring, give or take the extra few who may have been carried off by the epidemics, handed-down family gossip has it that he also produced a number of illegitimate children. The story goes that his grandson, Joseph (3.1), christened his own children with the surname spelt with a 'u' rather than an 'o' to distinguish between the legitimate and illegitimate sides of the family. In fact the 'Chipulina' variant of the surname is unique, but judging by the abundance of the original 'Chipolina' surname in modern Gibraltar, 'El Nazo' (5.1) must have done phenomenally well in his extra-marital adventures. 1830 That year the Gibraltar Police Force was created. It was to be the oldest of all colonial police forces, and only two years younger than the London force created by Peel. The establishment of this social service probably made possible the neglect of many others. In Gibraltar, as elsewhere, the main purpose of the police was to preserve the peace and to protect property. The more property a person had, the more protection he required. In 1830 the Rock must have been a potentially unruly place, full of smugglers, mariners, prostitutes, fugitives and drunken military personnel. This generally unappetising state of affairs does not seem to have deterred my great, great grandfather Diego Gomez (4.13) from marrying Isabel Josefa Rubio (4.14) and settling down to the business of making a living. Soon enough the marriage was consummated, and Isabel (4.14) gave birth to a son who was called Diego José (3.7) in honour of both his parents. The name was to cause problems as young Diego José (3.7) would eventually be recorded on all existing documents as Diego Gomez the elder (3.7) or Diego Gomez senior (3.7). By all logic he should have been Diego junior (3.7). Whatever the reason, Diego senior (3.7) was one oof my great grandfathers. Sketches of Gibraltar by Lieutenant-Colonel Thomas Staunton St. Clair. 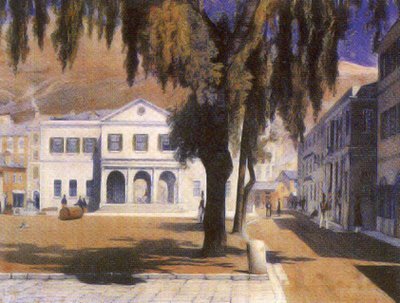 Stauntan was third in command in Gibraltar when he painted these sketches. During his stay he tried to paint Gibraltar from almost every conceivable angle. Diego José Gomez (3.7) would one day build himself a house in area beneath the Moorish Castle depicted in the bottom picture. It seems that Diego José (3.7) was not baptised at birth which suggests that the Government were still persisting in their attempts to limit the number of people emigrating to the Rock. Perhaps both or either of the Gomez and Rubio families were illegal immigrants. Diego José (3.7) was born in the family house in Crutchett's Ramp. This house was probably not the one at number 42 but whichever one it was, it seems that the family association with this steep semi-cul-de-sac on the north side of the town could well go back as far as Waterloo. It was all too much for George IV. 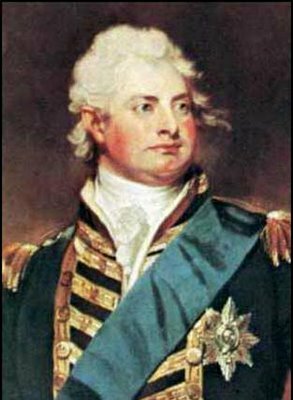 He died and William IV was crowned king. 1831 In January, the new charter of justice brought about the appointment of the first judge of the Supreme Court. Although in the past civilian offenders had invariably been tried by civilian rather than military courts, the titular head of the civil court had always been the Governor himself. The appointment of a Chief Justice meant that for the first time in its history Gibraltar had an independent judiciary. That same year a schedule was established for H.M Steam Packets to journey from Falmouth to Malta, allowing one day's stay in Gibraltar. A Register which was started in 1830 showed a civilian population of 17 024, a substantial increase despite continual epidemics of yellow fever. It seems that not even the prospects of dying a horrible death could compete with the continuing economic benefits of smuggling dutiable goods into Spain. The principal commodities were manufactured goods from Britain, and tobacco from Virginia and Jamaica. 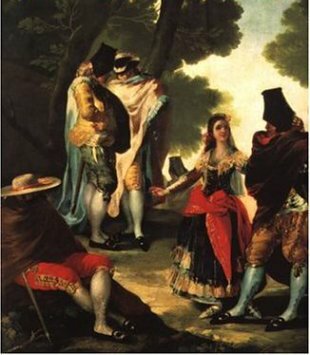 This later was to the detriment of Cuba and the cigarette factory in Seville later made famous by Prospero Merimee's book and George Bizet’s opera, Carmen. But only a few really made any serious money out of contraband. Most immigrants still had to make do with more traditional ways of making ends meet. 1832 In the midst of all this the Anglican church was completed and was opened to the public. 1833 On the 26th of June, at the age of 36, Maria Dominica Sacarello (4.6) gave birth to her youngest son and my great grandfather, Francisco Felipe Sacarello (3.3). It is not clear whether he was born in Gibraltar, Livorno or Spotorno. What is certain is that his father now 43 years old was still the master of a ship sailing from Livorno and had still not settled on the Rock. In Gibraltar the economy suddenly turned for the worse. The Naval Dockyard had ceased to be the principal arsenal for the British Mediterranean Fleet. 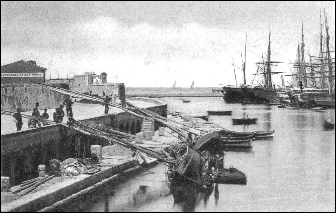 For once no major war was being waged in Europe, and Malta Yard was considered a more suitable alternative during peace time. 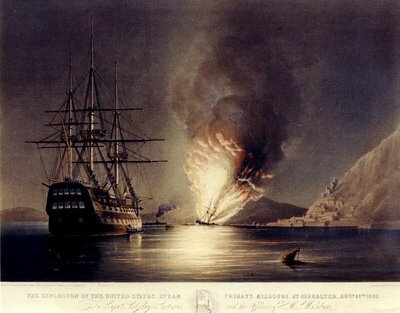 The advent of the steamship coupled with the general decrease in the number of warships coming to Gibraltar seriously affected the economy of the Rock. Shipchandling had always been a good source of local business and people engaged in this trade were certainly feeling the pinch. 1834 In fact the following year the census showed a civilian population of 15 002, the first substantial decrease for many decades. Additions to the population after this census came mainly in dribs and drabs from Spain and Genoa. 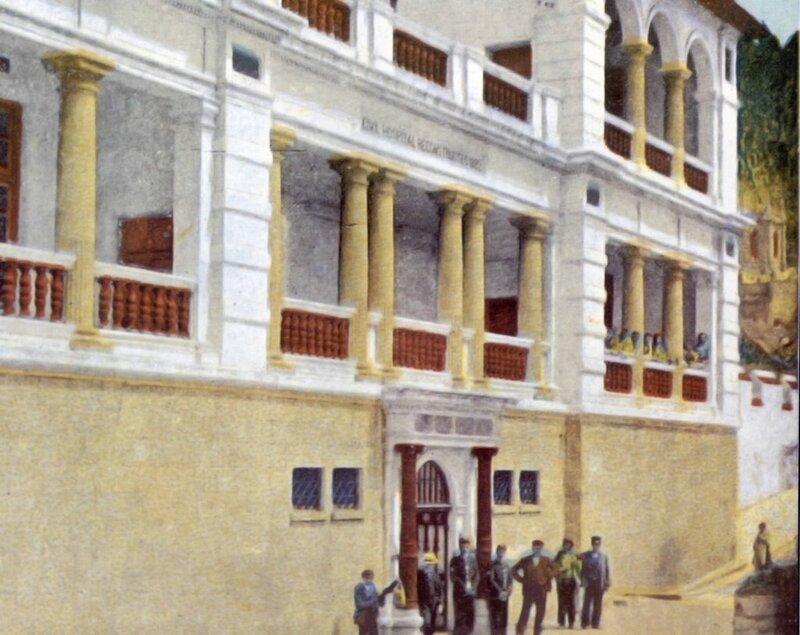 Approximately 2000 people, mainly women and children were now employed in Gibraltar's only manufacturing industry; the conversion of tobacco into cigars. By now Grand Parade had appropriately been renamed Commercial Square. It was a place where anything could be sold by auction, from a bale of calico to a schooner 'excellently found, copper bottomed and copper fastened'. Considering the number of ships that must have been brought to Gibraltar as 'prizes' over the years, it must have been a wonderful place for bargains of one sort or the other. Presumably as a reference to the auctioneer's hammer, the square soon came to be known as el Martillo by the locals. Commercial Square, Gibraltar. I think this picture is a contemporary one. The view is towards the west with Main Street just behind the main building. In June yet another epidemic broke out. For a change it was cholera this time. The authorities imposed a six month’s quarantine on the Rock. By September the epidemic had ended and 380 people had died. There was also an exceptional deluge that year which caused great damage to houses and shops and the town generally. 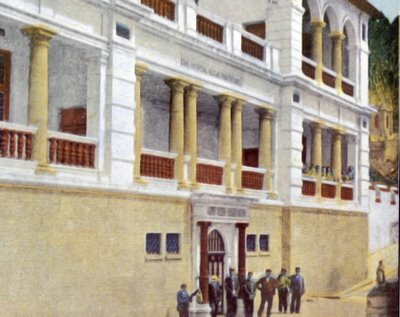 1836 In February the Christian Brothers opened a Catholic school in Gibraltar for 300 boys. Almost immediately they ran into difficulties with the local 'Junta' of Elders who at that time controlled the financial affairs of the Church. The 'Junta' insisted that the poorer boys should be segregated from the rest and continually interfered in the day to day running of the establishment. By August things had come to a head and further disputes led to the dismissal of the Christian Brothers who left the Rock, presumably in disgust. The School, however, remained open. That year Major-General Sir Alexander Woodford became Governor. 1837/9 The following year Maria Magdalena Fava was born in Gibraltar. The name does not appear in any of the older registers which suggest that her family may have arrived with the large influx of immigrants of the previous decades. That year William IV died and Queen Victoria was crowned Queen. Whatever other changes were taking place, Gibraltar continued to be a smugglers paradise. A certain Major Hort writing his impression of the place at the time described it as being, 'crowded with contrabandists.' This did not deter the Pope from appointing Bishop Hughes, an Irishman, as Vicar Apostolic to the parish of Gibraltar. Contrabandists, smugglers and other criminal elements notwithstanding, Rosio Bottaro (3.6) was born in Gibraltar that same year. She was one of my great grandmothers. There is no reference to the name in any previous local register and little is known of her ancestry other than that her family were of Genoese origin and had arrived in Gibraltar sometime in the early 19th century. The name Rosio is an unusual one, which may explain why she was usually known as Rosa to her family and friends. 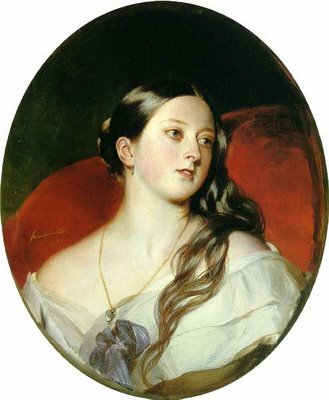 It is reasonable to suppose that the man she would eventually marry, Francis Thomas Letts (3.5), was more or less the same age as she and was also born during this period. Again little is known of his ancestors although it is almost certain that his parents came from the British Isles. The name Letts, however, does not appear in the Somerset House Records of that period but it is possible that his family originally came from the Midlands. 1842/43 This was the year when HMS Owen Glendower arrived from Chatham with 200 convicts for work on the development of the Dockyard and the construction of a new breakwater. Many were the best of Englishmen who had run foul of the restrictive political laws of the time. Among the convicts were the Tolpuddle Martyrs, founders of British and indeed world rural trade unionism. They were put to work on the massive masonry of the naval dockyard and other military fortifications. 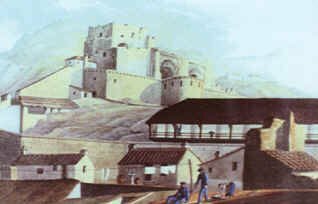 It has been suggested that the Gibraltarians at that time, and for quite a while after, acquired an aversion to manual work because of its association with convict labour. General Sir Robert T. Wilson became Governor and a Protestant bishopric was created to minister Anglican congregations throughout southern Europe. On the 21st of November 1842, Joseph Chipolina married Maria Fortunato. His wife's family were originally from Naples. Maria must have been noticeably pregnant on her wedding day as they had their first child, Angel Chipolina, a couple of months after their marriage. Whatever embarrassment this may have caused, it was short lived. Poor Angel didn't last long. He died 4 months later. On the 26th of March Maria Fortunato Chipolina (4.2) had her second child. He was named Joseph (3.1) after his father. He was one of my great grandfathers. USS Missouri exploding in Gibraltar Harbour. The Missouri was built to show off her state of the art steam propulsion technology. 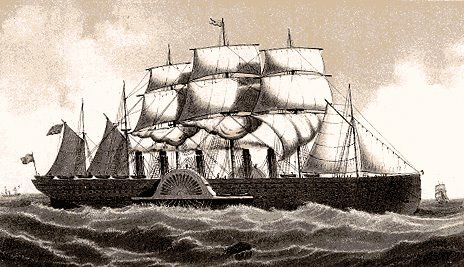 As the first steam ship to cross the Atlantic she was visiting Gibraltar in 1843 where she accidentally caught fire, exploded and sank. 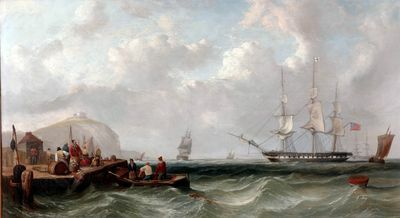 The ship of the line in the foreground is HMS Malabar. Two of my great, great grandparents, Joseph Chipolina and Maria Fortunato, married just a few months prior to this event. 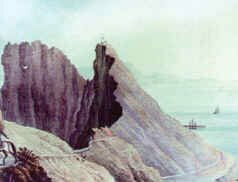 1845/6 Perhaps it was the more or less pleasant conditions which existed in the Rock at the time that induced Giovanni Batista Sacarello to make the move to Gibraltar. His son Francisco Felipe, who came with him, was only 12 years old at the time. Sadly the signs of rising prosperity were not universal. The notorious potato famine was well on its way in Ireland. Sensing serious trouble in his native England, Sir Robert Peel abolished the Corn Laws and probably saved Britain from revolution. On the 21st of January, Joseph Chipolina's sister Antonia was born. She would outlast them all living to a ripe old age of 91. The Theatre Royal in the early 20th century before its refurbishment.